Ok, I’ guilty… of three edits after posting for this week’s challenge. Black and White felt like an appropriate choice to focus on the aspect of “twinkle” instead of the collection of colors. I left the moon glow in with the thought that it provides a nice contrast. Second thought, I was inspired to enlarge the “twinkle” and remove the moon glow. Since “twinkle” is the key element, I like the color composition the best. Good morning Jane! I enjoyed your editing conversation above ☺️ Here’s my input. I really like the three lights and agree removing the moon is a good thing. But I would leave more space above the spire, which in your final version is a bit too close to the top. It’s such a lovely little Christmas scene and definitely worthy of some thought and playtime! Many wishes for a happy New Year… With lot's of great photo opportunities! Boy, you sure ask tough questions for 6 in the morning! I still like the first edit (the one I commented on) best. Yes, the twinkle of the street lights contrasts with the suffused glow of the bell tower and the haloed moon, so you’ve met the challenge. Furthermore, the B&W (chiaroscuro) helps keep the focus on the subject matter, a particular quality of light. Finally, the moon provides both a compositional and a symbolic strength. Compositionally, the black space to its left runs all the way to the bottom of the photo, providing the vertical “wall” that keeps the viewer’s eye within the picture. Symbolically, there’s a lovely curve of spots of light beginning at street level on the right and sweeping up past the human-made artifacts to the timeless heavenly body. But wait! there’s more! Your challenge was “twinkle”. To anyone of English descent, the most common association would be the nursery rhyme. And we’re now into mid-December. And you’ve managed to score a “little star” standing over a low-roofed, open-walled, impossibly tiny dwelling, which any European for at least the past millenium would identify as a stable — the stable. I mistook the larger building for a town hall, and the “stable” for the parking-lot payment booth. Old fire stations have bell towers, too (firemen also used the tower to hang up the hoses to dry!). 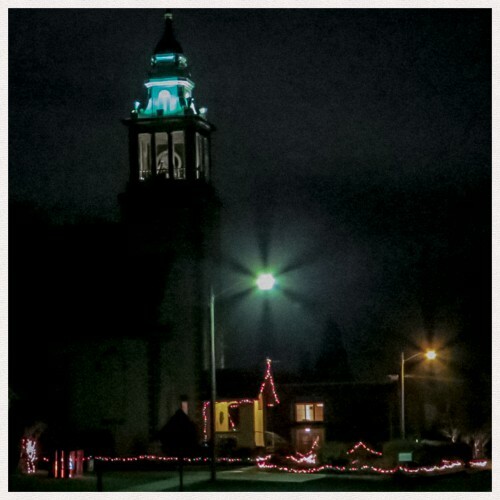 With the exception of the fire hall, either building helps tell the Christmas story of institutions interfering with, but never quite obscuring, the connection between the stable, the star, and the Moon. I would enjoy taking an art or photography composition class with you! A person who can share critiques with specific examples (positive and negative) is one who I respect and admire. Thank you… there is a lot to be said for dramatic qualities of black and white. Perhaps, I should have trusted the impact potential more. It’s great to have the ability to alter the same photo so readily, and see the compositional changes. The wonderful thing, like you said, is today’s freedom from film rolls, negatives, and smelly chemicals, which lets anyone with a camera (or phone!!!) simply muck around with a picture until we like what we see. We’ve come a long way. Yes, we’ve come a long way, and have the potential for saving money. I recall how expensive developing often was. But… then I think of the cost of internet service, cell phone provider, etc. It probably comes out the same. However, instant gratification is priceless!!! Sure! My favourite hand tool in my gardening bucket is a weeding knife with a thick, broad blade and a mildly serrated edge down one side. It does everything from opening bags of mulch to making planting holes for annuals to slicing and loosening potbound rootballs. I even weed with it! It’s a dandelion knife and a dandy tool, so when I started this blog under the delusion that it would be a gardening blog, I called myself “Dandyknife”. In a matter of weeks I reverted to my generalist style, but the moniker remains — which is fine, because although gardening isn’t “my life”, it’s still part of my life. Oh my, has it taken me this long to reply to your delightful, and quite appropriate thoughts about your blog name?! Please forgive the delay. Holidays have been an amazing experience this year… first on with a grandchild! Need I say more? My sister and I both love the foundations for your moniker. Nice shadow effect around the street lights. And is the guard house decorated with a string of Christmas lights?